Wouldn’t it be nice if your experiential program could pay for itself? Or at least, offset costs enough to save it from the chopping block when budgets get tight? Companies like Hasbro, Bounty and HP have created programs that despite not being entirely self-sufficient (yet), are offsetting costs by bringing in money to dump back into the program. Last year Hasbro created its own Nerf Dart Tag League competitions (think Frisbee Golf), a grassroots effort targeting boys 8 to 12 years old in 15 markets in conjunction with the AST Dew Tour. The beauty of the program is the fact that in order to compete, consumers have to buy their own equipment, which amounts to $25 to $30 a head. This not only drives sales, but it saves the company from having to invest in gearing up participants. Hasbro’s NDTL has also set up a microsite at hasbro.com/nerf/ndtl where players and prospective challengers can get info on where to find upcoming games, register for the league and, of course, buy products. 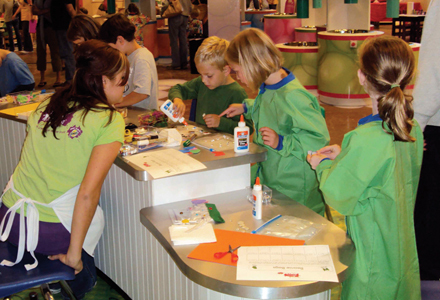 For this year, Hasbro is working on a proprietary tour that as it evolves may also enjoy the perks of self-sufficiency, potentially using tournament entry fees to offset program hard costs and opening events to additional sponsorship revenue and partners. The long-term goal is to get Dart Tag competitions on Nickelodeon and Cartoon Network. “Hasbro’s Nerf was savvy in creating this league and these events because consumers have to purchase the products in order to participate,” says Peter Pearce, vp-marketing at Atlanta-based Vivid Marketing, which handles the program. “Therefore, it gets some nice direct sales attributed to the grassroots events. It’s a drop in the bucket in terms of sales, if you’re getting a couple of thousand participants, but if we have 100,000 NDTL members, then it’ll really start helping.” The key, adds Pearce, is to make your event a destination and create demand for participation instead of disrupting random people on the street. And no place is more of a destination for Chicago-area kids right now than Make-A-Messterpiece, the brainchild of Manchester, NH-based Gigunda Group. The agency says the program wouldn’t have been possible without the backing of Bounty, which increased its original investment for a 5,000-square-foot space into 10,000 square feet of creative activities for kids. (The program is so popular it’s now going into its ninth month.) Bounty supplements its investment by charging families at the door: children ages two and older pay $10 (those under two pay $2) for an all-day stay, and special project stations and classes are an additional $5. The admission covers overhead costs like utilities, materials, staffing, marketing and stocking a retail boutique and café. If making your event program self-sufficient is the ultimate goal, how do you structure and then manage the program? Bounty and Gigunda started by clearly defining their mission, which they say is nurturing children’s curiosity and creativity by encouraging hands-on learning. It’s providing not only an exceptional experience, but identifying a service that consumers see value in and can’t find anywhere else. Delivering product directly to its customers is what it’s all about for HP’s SMB (Small to Medium Business) Experience Tour, which since its six-month 2010 launch has seen more than $1.3 million in direct sales, a portion of which will be reinvested back into the program. “The SMB Experience Tour has more than paid for itself and as a result, funds generated from the tour’s direct product sales will be distributed back into the program to make it even bigger and better,” Mary Hart, HP marketing program manager, says. The revenue generated by the tour covers everyday management costs, including staffing and fees for each event (business expos and the like) the brand participates in. Right now the tour is self-sufficient with the one vehicle it travels in, which is equipped with product and demo stations. However, if HP wants to add more vehicles, which is likely, then there is an initial start-up cost it must account for. After that, the vehicles become self-sufficient like the one currently on the road. Structuring and managing a revenue-generating tour has a lot to do with building for the long haul, says Chad Tons, president at Los Angeles-based Infinity Marketing Team, which handles the HP tour. Changes to the program will incur extra costs.